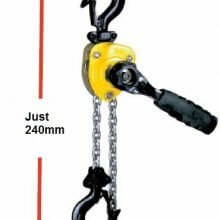 Our smallest ratchet lever hoist with lifting capacities up to 500kg available. The Yale ‘Handy’ pull lift / lever hoist is both compact and lightweight, a perfect tool box companion. This little lifting device is the smallest lever hoist that we supply, it is the Yale Handy lever hoist and very appropriately named. 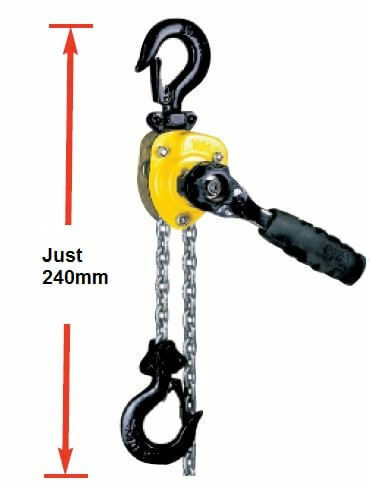 This is a very handy, convenient lifting, pulling and tensioning device and perfect for keeping to hand, in your tool box or work vehicle. 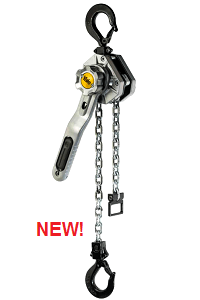 This little ratchet lever hoist is very compact with the smallest of the 2 models measuring just 240mm at closed height, the largest stands at 282mm high. The smallest 250kg model weighs in at just 2.2kg with the standard 1.5 metre height of lift, the largest 500kg lifting capacity 'Handy' weighs only 2.8kg. 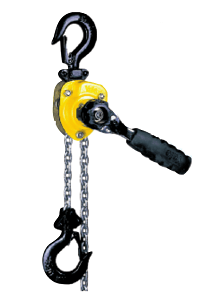 The small size and weight of this lever hoist makes it ideal for use across multiple areas due to the fact that it is easy to transport virtually anywhere, it is also perfect for use in confined spaces where standard lever hoists are simply too big. 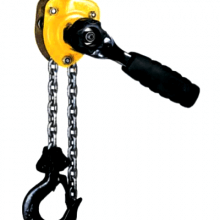 The low weight and small, simple design of the 'Handy' pull lift / lever hoist makes it quick and easy to use, just like a standard ratchet lever hoist but on a smaller scale. 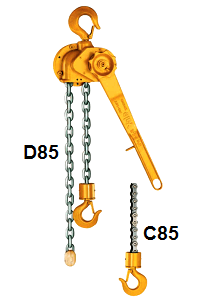 The lever hoist comes with a free chaining function as standard to enable easy chain release for quick load attachment. The chain may be pulled through in both directions. 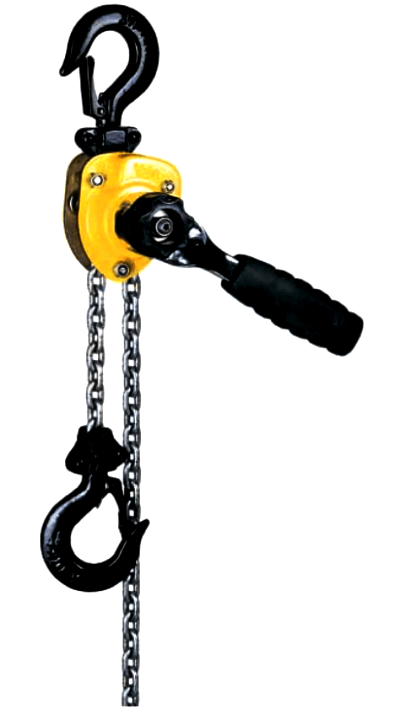 The 'Handy' pull lift consists of both a top hook and a bottom hook which feature safety latches to ensure load retention and secure anchoring. 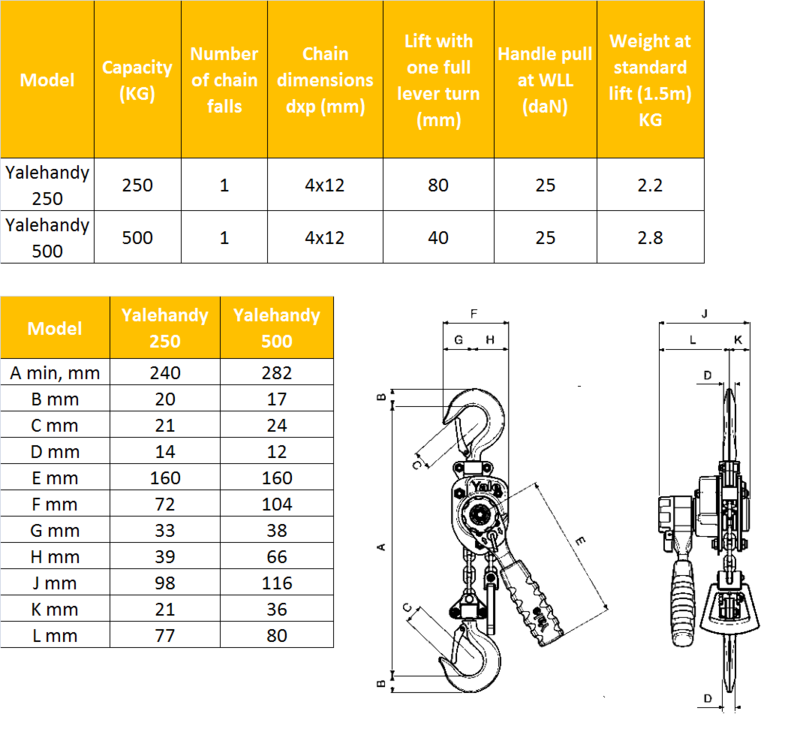 As with all Yale lever hoists only quality components are used so you can be confident of a quality lever hoist. If you would like a quick quote, or need to find out more about this or any other hoist then our sales team are always ready to help, so give us a call on 01384 75182, or email us using the contact us form.